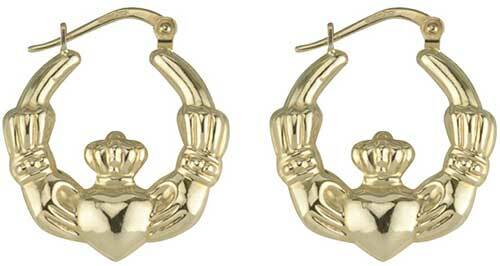 These Claddagh hoop earrings in 10K gold are our largest design. These double sided Claddagh hoop earrings are crafted in 10K yellow gold. The large and hollow gold Claddagh earrings measure 1” wide x 1 1/8" tall, and feature hinged fasteners.